Planning allows you to take a poor habit, and develop a plan to change that habit, and then develop a healthy diet habit that works for you. We have all heard the saying “If you fail to plan, you plan to fail”. What that means is that success belongs to those who plan. If you cruise along with no plans, you will likely fail. You will have no measurable goal to shoot for. Everyone needs goals related to weight control, and these goals should be planned. Identify the poor habit that you want to change. Brainstorm Lifestyle Solutions to change the habit and try them. Did your plan work to fix your poor habit? Your new healthy diet habit is: _________. Plan: My plan to deal with night time eating. My poor food habit that I want to change is, night time eating. This is a problem because I eat too many calories! My goal would be to reduce night time eating. Eat more in the day time, to end evening hunger. Keep healthy veggie snacks available for evening munching that are lower calorie. Do not buy the processed junk foods that I like to have at night. My plan to change this poor food habit of night time eating worked well. I developed the healthy diet habit of eating a healthy snack at night, and not buying my favorite junk foods. Planning allows you to take a poor food habit and develop a plan to change that habit and develop a healthy diet habit that works for you. 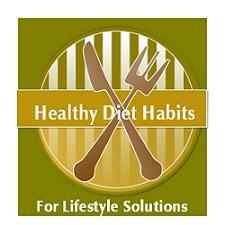 If you can incorporate your healthy diet habit into your life for a month, you will be well on your way to success! None of us is alike, and therefore none of us will have the same plans, goals or healthy diet habits! I would not suggest trying to change your entire life at once. Plan three changes per month, and when those new habits are successful, add three new habits that you wish to change.